Hello, my name is Phuong Nguyen, a graphic designer was born and raised in Vietnam, I graduated with a Bachelor's Degree from Academy of Art University in San Francisco. Recently, I'm having a wonderful time as a student of Advertising and Marketing Communication Management program in Sheridan College and being eager for working in a creative field to expand my skill sets. Have you ever been outside and encountered an advertising piece that could be a poster, a promotion video, or even an advertising campaign across all media and billboard? Everything that you see is not only the image of a brand trying to show off and approach you, but it's also a remarkable effort from people behind the scenes to give you the complete product. Figure 1. From "Black and white coffee mug mock up with notebooks, pen and glasses on work desk," by Sigridstock, n.d., https://www.shutterstock.com/image-photo/black-white-coffee-mug-mock-notebooks-724222396/. Copyright 2018 by Sigridstock. Marketing and design teams are always the people who show the importance of their work. Each side believes that their ideas are outstanding and recognized, so that leads to a lot of controversy in the debate. However, they cannot work without each other because their role is extremely complementary to each other. Simply, marketers need the look, designers need content. I improvise to create a term as Visual Marketing to convey the unity in the work of marketing and design. Both are important components in the process of creating the advertising campaigns’ success and approaching customers out there. Marketing and design are two very important steps in every advertising campaign, and they also greatly complement and support each other. Nowadays, in every advertising campaign, creative teams take many steps to be able to transmit content and image to the audience; two of those steps are marketing and design playing significant roles in the formation and operation of the advertising campaign. Figure 2. From "Blank books on a shelf and one with idea cover," by S. Cracho, n.d., https://www.shutterstock.com/image-photo/blank-books-on-shelf-one-idea-143419957/. Copyright 2018 by Sfio Cracho. If marketing analyzes and plans the content, the design is the work of specifying the content of marketing into graphic’s elements to bring customers a more comprehensive and unique view of products and brands. When it comes to the story of branding and brand identity, how much these two elements merge together, the more successful the campaign is. The marketing team is in charge of planning the content in detail, then designers will make that content available as graphic images and text to approach customers more easily. Whenever you are moving on the street, going shopping, and interacting with everything around, you not only see images, designs, and products, but also go through someone’s mind that could be an idea, a story, or a message. This connection enhances visual communication to target audiences for a specific purpose. The contrast between marketing and design is quite interesting. When you glance at it, you will feel that they are two teams that can never be integrated, but there are some individual qualities placed side by side will make you feel a deeper connection. Peter Thomson (2009)–a digital brand strategist based in Auckland, New Zealand–states that the mindsets of marketing and design are the actual difference when they approach a problem. Figure 3. 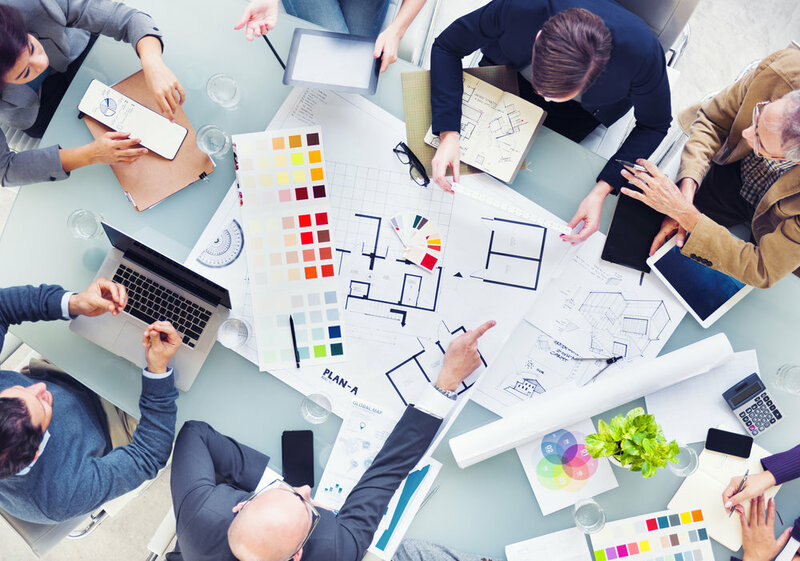 From "Design Team Planning for a New Project," by Rawpixel.com, n.d., https://www.shutterstock.com/image-photo/design-team-planning-new-project-189590255/. Copyright 2018 by Rawpixel.com. According to his blog, Thomson also has a very detailed view of the difference between marketing and design teams. He analyzes every aspect of thinking and strategy of marketers and designers in the following chart (Thomson, 2009). Filter people as individuals to enjoy or eliminate. Communicate efficiently with people in aggregate. Additionally, a designer from Ukraine names Olia Gozha (2016) also shares on her Twitter about the different perspectives from marketers and designers. Figure 4. 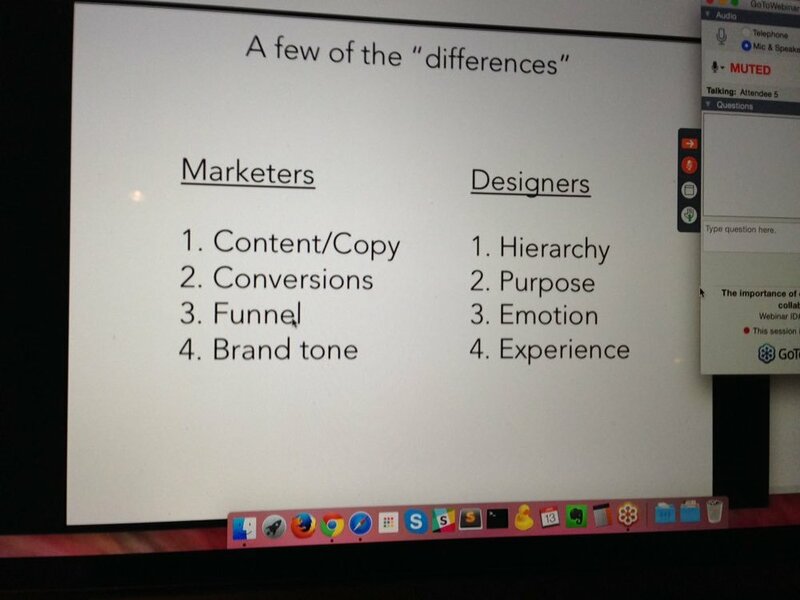 From "Marketers & designers do have the same goals but look at them from different perspectives #invisionwebinar," by O. Gozha, 2016, https://twitter.com/OliaGozha/status/687337397521113088/. Copyright 2018 by Olia Gozha. In a conversation about the idea and execution of the advertising campaign, marketers tend to talk about the smart content strategies, customers’ interaction with the product, methods to delivery the sale system, and consistency in brand voice; meanwhile, designers often emphasize the focus point on the brand, the purpose of creation, the sense of art, and experience the community's tendency toward the brand. In short, marketers are the ones who create the personality and soul of a brand, and designers are the creators of beauty and inspiration to communicate and interact with brands. These different roles are towards a mission that is to bring your brand to the real life. Be clever and beautiful are two simple terms that demonstrate the relationship between marketing and design in the advertising industry. This resonance could be the leading reason you hit or miss your goals. Adobe has introduced a talk show of Rupert Knowles and Matthew Winwood in the scene of portraying a marketer and a designer in a workplace (Adobe UK, 2015). Besides highlighting the preeminent features of Adobe Creative Cloud that helps them delivery more design content and channels for customers in the digital world, you can imply that they collaborate rhythmically to integrate many design options in the review process to increase efficient of marketing assets. Working in a creative agency, you will meet many clients from different brands around the world. When they come to the agency, they are definitely looking for a suitable strategy for their products or services. To attract more customers, the clients want the image of the brand to be widely advertised and widely known, or even newcomers must encounter that image at least once. Major departments working with the clients will usually be the accounting, marketing, creative, and production. These teams work together and develop an effective promotion strategy with a reasonable budget, meaningful content, and quality product. Figure 5. From "Teamwork Team Together Collaboration Meeting Brainstorming Ideas Concept," by Rawpixel.com, n.d., https://www.shutterstock.com/image-photo/teamwork-team-together-collaboration-meeting-brainstorming-263833961/. Copyright 2018 by Rawpixel.com. In the process of making an advertising campaign, the two components that receive the most exposure and interaction are marketing and design teams. They not only communicate directly with the clients but also argue together to bring unique ideas and plan solid contents to run the campaign. Although the battle of the marketing and design groups never stops, their ultimate goal is to please the client and bring the brand to reach the consumers. You can understand that marketers and designers are the teams who offer the most effective solution to any problem from the clients. The collaboration in marketing and design is very challenging, but it is also important to create any promotional piece. To create the success of anything, you need a combination of good methods and a variety of supportive tools to effectively implement the problem. Therefore, the balance and harmony between marketing and design are always appreciated to reach the same finish line. In an advertising campaign, although marketers and designers usually work in parallel and support each other, the fact is that they are not always able to coordinate with each other. The views and thoughts of marketers and designers are different in many situations. You may hear about the confrontation between marketers and designers, so you probably assume that marketing and design are two separate fields, but in fact, design is a subset of marketing. To unleash the knot for this fight, designers of the brand needs to know the marketing’s basic foundations; meanwhile, marketers must know the principles of the brand and design elements. For the explosion of digital marketing, you will see that the collaboration of marketers and designers is the power of advertising. Figure 6. From "Brainstorming creative team idea discussion people. Teamwork staff around table laptop chief art director designer programmer. Flat style vector illustration," by StonePictures, n.d., https://www.shutterstock.com/image-vector/brainstorming-creative-team-idea-discussion-people-675956599/. Copyright 2018 by StonePictures. When you have a chance to work with a designer, you can easily see a strong personality and a big ego. Designers are thinkers on the aesthetic point of view. Every designer always has very different thoughts on the design trend, and they would like to build their own creative style through each work. Therefore, you sometimes find that the design products represent another’s personality because a style is what makes the difference of each designer. Moreover, the designers greatly appreciate their path and their evaluation, and they may not want to change details on the work for a reason that doesn’t fit on costumers’ taste. Meanwhile, marketers always pay attention to brand’s base and customers’ needs. Marketing people try to create contents and strategies consistent with the consumer insight. They highly demand in concept and design, which is ensuring the highest suitability for customers as well as while expressing the spirit and characteristics of the brand. In the era of new media, marketers need to know at least about the design’s fundamentals and acknowledge the constant change in design trends. Marketers can understand why designers use this layout, color, font, etc. to create unique design products and publications. Figure 7. From "Flat line design website banner of exchanging ideas, dialog and dispute, experiences, knowledge, born business project startup, thought process mechanism for web design, marketing and print material," by D. Domino, n.d., https://www.shutterstock.com/image-vector/flat-line-design-website-banner-exchanging-421087330/. Copyright 2018 by Dmitriy Domino. Different thinking has made the coordination of marketers and designers more challenging. The solution to this problem is that they need to learn from each other. Both of marketers and designers can slowly approach each other’s opinion and information to yield beautiful outcomes in any advertising campaign.